Is there any way to hide labels and not combine taskbar buttons? Or even better, to exclude only certain applications from combining? My main problem is that I switch a lot between two instances of a single application, and having to hover over combined icon and then choosing the correct one. Alt-Tabbing is not a good alternative when I'm switching between more than three applications; clicking on taskbar only once is what I'm looking for. It's something of a hack job, but this might do the trick! It requires doing a bit of registry editing to shrink the taskbar icons so that the labels auto-hide. In the "Taskbar Appearance" group, change the "Taskbar Button" option to "Never combine" if you don't want stacking. Double click on the MinWidth entry. If you want just the buttons to show, set this to 38 if you're using small buttons, 52 if you're using large buttons (or 54 in Windows 8). Otherwise any value above 38 will work. If you set a value below 38, the buttons will behave oddly. If your main display (on Windows 8.1 or later) has non-standard DPI (e.g. it's Retina or 4k display) you might need to multiply these numbers by the factor of 1.25, 1.5 or 2. Otherwise buttons will shrink / animate incorrectly. Find the "MinWidth" entry and delete it. This is an old question, but the answer of Kyle B. didn't work well for me (glitches and flickering), so I'd like to propose an alternative solution. Configure your taskbar for Always combine, hide labels. 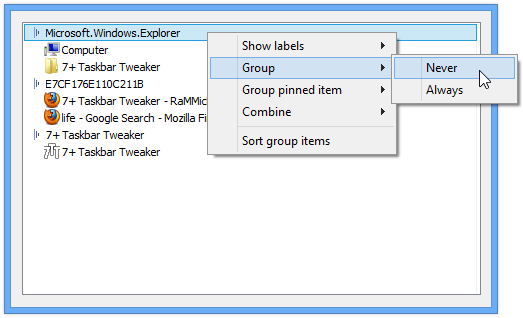 Select the Don't combine grouped buttons option. Windows 7 taskbar: How to uncombine only some icons? Windows 7 and Internet Explorer 8: no grouping per browser instance? How do you change the number of visible windows in each superbar icon? 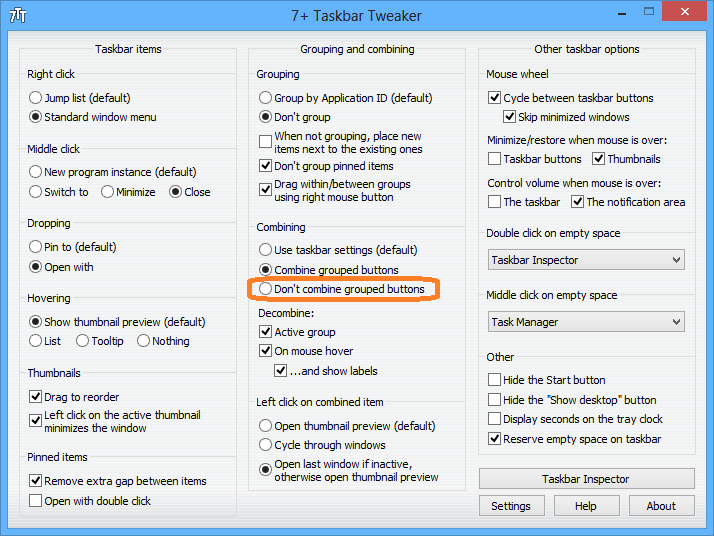 How to change the taskbar grouping behavior for a single application in windows-7? How do I perform multi-window operations on a non-combined group of windows in Windows 7? How to always show titles on Windows 7 Taskbar thumbail preview? Prevent Windows 10 from automatically re-ordering taskbar hover previews in a group? How to fix Windows 10's taskbar item ordering?